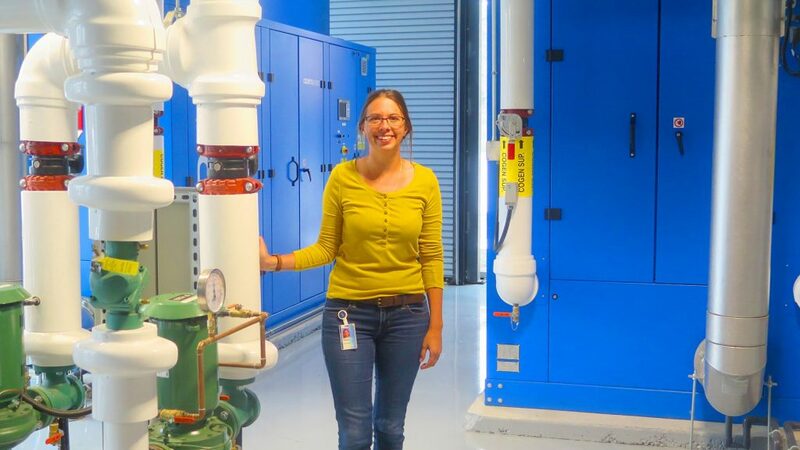 The Energy Centre is the highly visible mechanical room that serves as a living lab, says Sheridan’s Katie Rinas. Creating a brand-new district energy system would theoretically allow HVAC professionals to achieve an ideal outcome. The reality is that usually district energy is proposed for a built-up area with existing infrastructure and challenging older buildings. It can be an achievement to just come close to energy efficiency goals. Two recent district energy projects show what can be achieved. 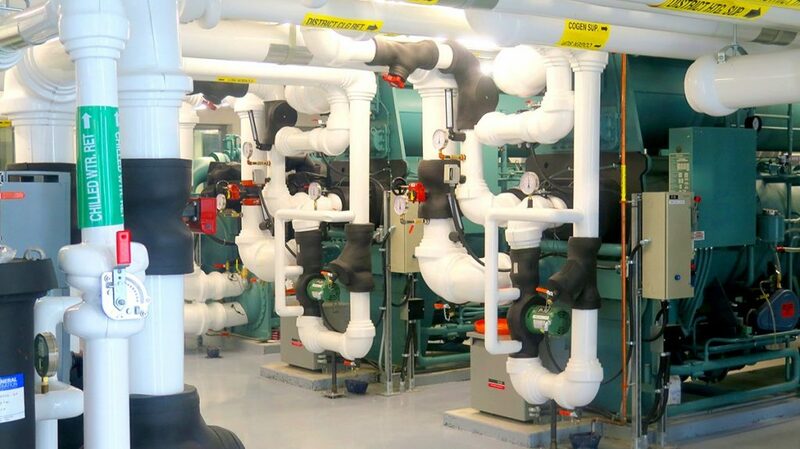 University campuses have long been an obvious location for district heating and cooling. Today, as some of the old steam heating networks move towards the end of their useful lives, many are being replaced with hot water systems. Hot water is less demanding, usually saves energy, and matches up with new and renovated buildings that have more efficient envelopes. At its Brampton, Ont. site, Sheridan College has switched to hot water, combined heat and power (CHP) boilers, better windows and insulation wherever possible, hydronic radiant floor heating in the newest buildings, chilled beams for cooling in some classrooms and labs, and state of the art piping between the school’s new energy centre and conditioned spaces. 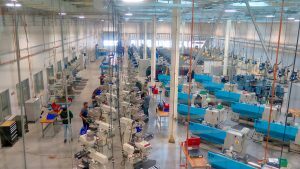 The new Skilled Trades Centre is a state-of-the-art training facility. The equipment in the Energy Centre can be seen through glass on several angles by students and visitors. Walt Disney would love it. Mechanical ducts, plumbing, electrical conduit and IT cabling are also left exposed. The hot water system serves four buildings now with a few more to be added in future, bringing the total to about one million square feet. “By going to a lower temperature system, we have flexibility to pursue a path to lower carbon fuel sources in the future,” added Rinas. Combined heat and power boilers save about 30 percent on energy costs. 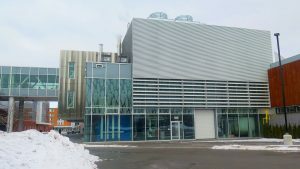 The school has some renewables and will add more, plus energy storage. The new building is 130,000 square feet and includes 22 flexible classrooms, labs and workshops for plumbing, mechanical, machining, electrical, millwright, and welding. There is a learning commons and a three-storey atrium. The CHP system saves about 30 percent on energy for heating, cooling, domestic hot water, and generating electricity. “It provides some independence from utilities, sets us up for more renewables and makes electricity generation more efficient,” noted Rinas. The system significantly reduces electricity transmission losses. 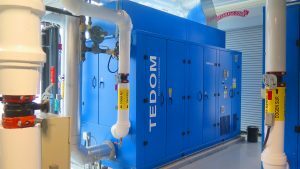 The chiller system is also part of the learning experience in the Energy Centre. In the newer buildings, ventilation includes energy reclaim devices. System energy performance is 100 kilowatt hours per square meter per year (32.2 kBtu/ft2/yr), which exceeds the LEED Gold standard. With in-floor radiant, the philosophy is to heat or cool only the occupied area and maintain a lower overall indoor temperature. “Fan energy has been reduced using chilled beams with cooling control at the zone level. There’s very little air movement,” explained Sinnock. Dew point sensors are located throughout the complex. A total of 20,086 meters (65,900 ft) of 5/8” Rehau oxygen barrier PEX tubing was used for the in-floor radiant inside the building, and also outdoors for snowmelt under perimeter sidewalks and a receiving dock. Students learn machining techniques on the latest equipment in this metal lab. Installers from The Aquila Group, Toronto, were faced with a tight timeframe, but 3D modeling was used to prevent unexpected interferences and plan everything very precisely. A small on-site pipe prefab shop was also set up to improve production efficiency. Time was saved by using Victaulic installation-ready couplings, valves, fittings, and Koil-Kits packages.